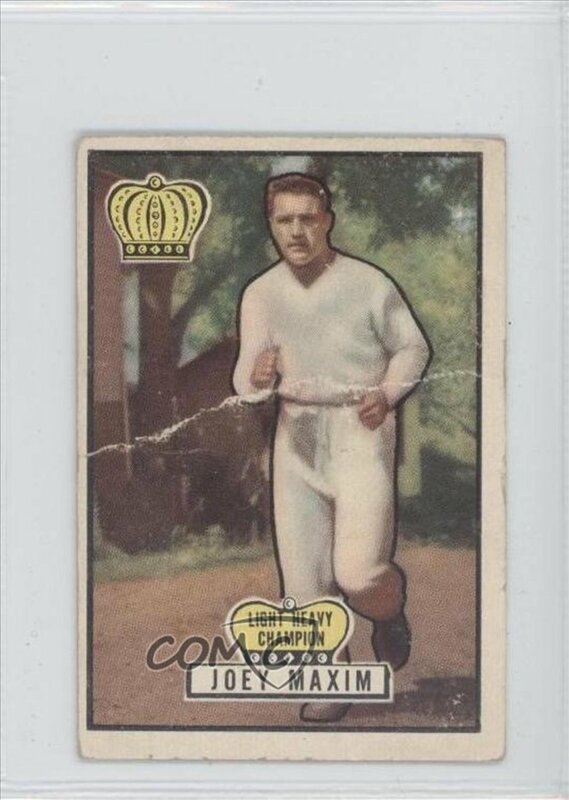 Yesterday I shared my creation of a Joey Maxim cut autograph and a lot of you were wondering who the hell is Joey Maxim? Joey who was born Giuseppe Antonio Berardinelli was one of the greatest light heavyweight fighters of all time. He took his name from the Maxim gun which was the world’s first self-operating machine gun. It was appropriate because he could throw left jabs as fast as a machine gun. He got his start in boxing while in the military where he used to fight exhibitions as an army officer. Can you imagine having to take on you company commander in boxing and he could knock you out cold? Talk about gaining instant respect! From there he went on to become a Golden Gloves champion, then turned professional in 1940. It took him 87 fights and 10 years, but he finally got is title shot at the age of 28 against Eddie Mills. The fight was in Mill’s home of London, England. He knocked out Mills which such a punch that they found teeth embedded in his gloves. Mills never fought again! After becoming the Light Heavyweight champion of the world. He set his sights on what was considered the crown of the boxing world, the World Heavyweight Championship, which was held by Ezzard Charles. He went the distance with Charles but lost out on points. His most famous fight was with Sugar Ray Robinson in 1952. The fight was held at Yankee Stadium in the middle of a brutal heat wave. Halfway through the fight the original referee had to tap out because of the heat. A substitute ref came in to finish the fight. Robinson because of both the staggering heat and the power of Maxim’s punches collapsed at the end of the 13th round. Although we was able to get to his feet, he was not able to continue when the bell for the 14th round was rung. Maxim was credited with a TKO. It was reported that both fighters lost almost 20 lbs during the fight. It was the only fight in Robinson’s career (200 career fights) where he was knocked out. That was the last big fight for Maxim who only fought 15 more times over the rest of his career. He career ended with a loss during a title rematch with Archie Moore. He had an amazing career though, beating the likes of Floyd Patterson, Jersey Joe Walcott, and Jimmy Bivins, and he was only knocked out once in his 115 professional fight career. Following his career he worked as a taxi driver, comedian and casino greeter. In 1994 he was inducted into the International Boxing Hall of Fame. He was also an extra in 1999’s movie Play it to the Bone. I had to make him a Sport King, it just seemed fitting. He did have a trading card issued, it was 1951 Topps Ringside #8 pictured below. It’s a fairly inexpensive card you can get yourself on eBay for around $10. I know there are not many boxing fans left out there and probably fewer that actually read my blog, but if you wanted to know why I made this card, it’s because he was a damn good boxer.